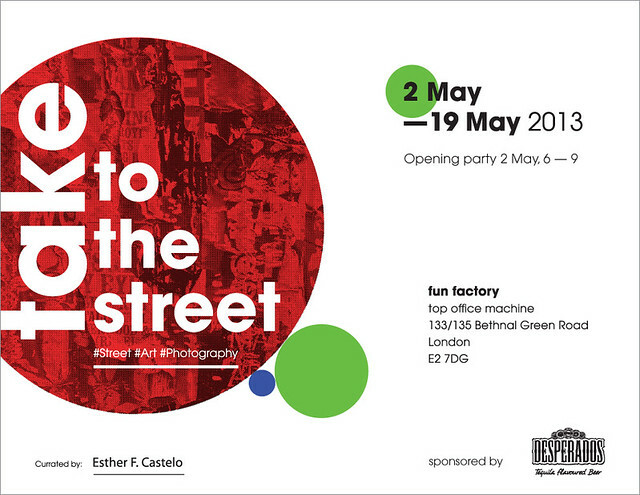 Curator and friend of Hookedblog, Esther F. Castelo recently contacted us to about taking part in a group show she was putting together called Take To The Street, a street art and graffiti photographic exhibition. We were asked to submit a selection of images which will go on show on Thursday 2nd May along with some of the other leading London street art & graffiti photographers including Nolionsinengland, Ian Cox, Unusualimage, Mark Rigney (Hookedblog), Howaboutno, Joeppo, Delete, Myriam JC Preston, Alex Ellison, Doug Sherman and Cheffo31. We loved the idea of all these photographer taking a selection of their images offline and into a gallery space. A series of workshops and talks are also planned for at the space which we have listed below. We are looking forward to the street art / graffiti photo pub crawl!! Further details for this event can be found on the Facebook page here. Sunday 19th May — 3pm Open discussion addressing the current situation of Street Art & Graffiti Photography. The exhibition opened with huge crowds in attendance on the 2nd May 2013, the exhibition is on show until the 19th May.